Amber loves history! She likes to find a history fact for the day and then she will find a book or encyclopedia about her fact and take it to bed with her at night. When the Review Crew was offered This Week In History from Thomas Jefferson Education I knew she would love it. This Week In History is a daily resource that will take you on an adventure. Each day you will discover historical events in math, science, language skills, geography, current events, the arts, and more. The content bundle can be viewed online at Thomas Jefferson Education or directly from your email inbox. All the content can be search by date, topic, or key word. This Week In History can be used with every homeschool, no matter what style of education you normally use. If you are a planner you can review the coming week's resources to find what would fit in with your plans or search the archives by date to find what you need. You can also find what you need the day you are working or sit down with your kids and start learning together. It is recommended for grade K-12 but everyone could benefit from using it. Included with the history facts are writing or discussion ideas and a list of resources. The resource include links for further information, activities, music, science projects, lab sheets, articles from magazines, games, coloring pages, and so much more. We are on our break from school and this has been a great resource for the kids to have fun learn with. Amber (age 11) is my history nut & she has used this more than Delaney (age 10) & Alaina (age 7), but they all three loved clicking on the links to learn more. They really liked that the topics were short but contained a lot of information and activities. This week has been one of their favorites, they learned about the Leaning Tower of Piza, magnets, Morse code, & they can't wait for silly putty tomorrow. The more we used TWIH the more we liked it. Each week contains a good variety of different history facts to learn and I was really impressed with the lab sheets and the content of the resources. 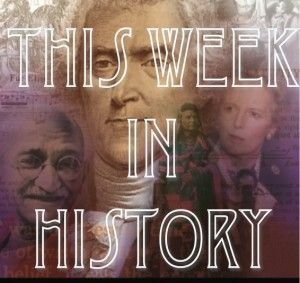 Subscribe to This Week In History for $9.99 a month. Disclaimer: As a member of the Schoolhouse Review Crew I received an one-year subscription to This Week In History free of charge, from Thomas Jefferson Education, to use with my children in exchange for my honest review.